OUT WITH THE OLD AND IN WITH THE NEW??? So....I have been thinking about buying another scooter but wondering why I think I need 4 scooters in my shed when I can only ever ride one at a time. I am liking the look of the 300 Super and toying with the idea of grabbing one when this contract is over. 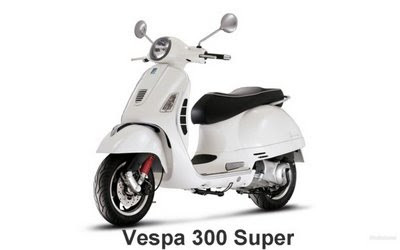 What better way than spoiling myself with a brand new Vespa. Is it possible to love both old geared scoots and new twisties alike? I'll just go with white as its safer on the road. I'll be able to jazz her up with decals if I get bored. Now all I need is a suitable name for her, any suggestions? From last time I wrote, had some issues to resolve again, I got my RWC but the motor was smoking and behaving badly. I broke it down again and replaced the crank and seals again. I also managed to repair the rear hub (if you recall the bearing retainer was welded in). Got my dremil into it, cut it out and popped out the bits, luckily the thread was undamaged, and came up like new! I got the cases and motor looking really clean and I think that every part has been replaced/serviced and up to grade. Put it all back together, started first shot, but still had smoke issues....... very unhappy at this point, did the job twice but I guess I put in all that effort onto a set of cases that must have a warp issue internally or a crack that is not allowing a seal to happen between the gear box and rotor area. OK, picked my self back up and kicked in plan 'B'. Got the LML P150 motor I had as a backup, and did an inspection. This motor looks fresh, popped the head and cylinder off and inspected the inside via the clutch cover and rotor area with a micro torch (those with a bendy head look like ET ) and the guts look brand new! Decided that I was not going to split this motor, quite frankly a bit sick of all the rebuilds and felt I needed to get some time on the road before the weather gets bad. I did change the cylinder, head and piston as there was scoring in the cylinder and the piston was a 3rd over sized and had scoring on it - and its cheaper to replace than machine a 4th oversize and also that would have been the limit as 4th is as far as you can go. Dave hand cut the ports on a new 3 port cylinder and honed it nicely. Put it all together, did the electrical conversion (this was fun, I love electronics) and mounted the CDI and regulator. Converted the motor to a 8 inch (very simple, dust cover plate, brakes and rear hob fir straight on from the old motor) Mounted the lot - it went straight in, no issue. Fired it up - had an idle issue (would not stay on unless I opened up the throttle), did a carb rebuild and found that the mixture screw was missing - reassembled and now she is running well! No smoke - I was worried about the seals, but they seem OK. I am running in the motor now as I have the new rings in it, but for the last couple of weeks she has been sweet! I think she has finally in one piece - can't wait to open her up, will have to wait for another 600km for the run in to finish, but seems to have more power (it is a 3port motor and 20/20 carb!). Have to sort out a couple of mystery vibration in the body, but I am happy with her.